Squad Radios are an area of interest but this is the first time I've worked with German radios. A Squad Radio is one used for short range communications at the squad level. They typically operate in the VHF low band and use FM modulation. Lower frequencies require impractically long antennas and have the possibility of unintended long range propagation because of bouncing off the atmosphere. Higher frequencies require parts that cost more because in general the higher the frequency the higher the parts cost. The advantage of using FM modulation is because of the capture effect there is less noise making for a better signal/noise ratio than you would get with AM modulation. The disadvantage of FM modulation is because of the capture effect it's possible for an enemy to capture your frequency of operation by transmitting a CW carrier with a few dB more received power than your desired station. The range of line of sight radios, like the squad radio family, is mainly determined by antenna height above local ground. Not by the radio's transmit power. So squad radios typically have output powers around 1 Watt and a planning range in the hundreds of yards, more if one or both ends of the link are on a hill top. I don't know much about the W.W.II vehicle mounted VHF low band radios. 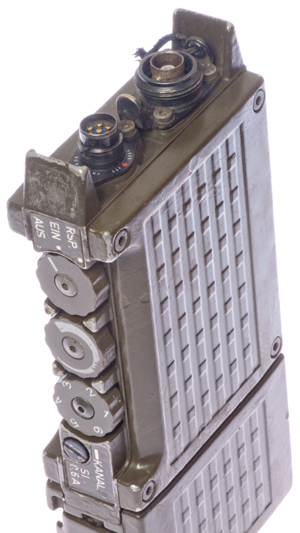 In Vietnam there were the VRC-12 series radios (RT-246, RT-524, R-442). 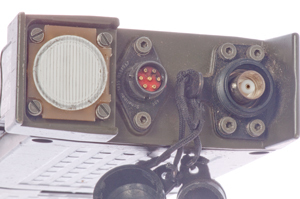 Starting with the various desert actions the SINCGARS family (RT-1439, RT-1523) of mostly vehicle mounted VHF low band radios came into being. The SINCGARS radios have frequency hopping as a countermeasure to squelch capture, but it's not intended as a communications privacy measure. For that the KY-57 can be added to the radio. There's a parallel line of radios for aircraft use and another for use on ships, although many of the land based radios are used in ships. W.W.II walkie-talkie tube radios like the BC-1000 (Wiki: SCR-300) were replaced with the tube type PRC-8, PRC-9 & PRC-10 backpack VHF low band squad radios. This was in the old days where frequencies were assigned based on who was carrying them to Armor (PRC-8), Artillery (PRC-9) and Infantry (PRC-10). The problem with this was there were a very small number of channels where you could intercommunicate. In the middle of the Vietnam era the PRC-25 back pack radio came out and was well received because it was so easy to use. Later it was upgraded to allow multichannel telephone and crypto and renamed the PRC-77. The KY-57 can be used with the PRC-77 for voice security. There were no W.W. II VHF low band handie-talkie tube radios, there was an HF handie-talkie, the BC-611. 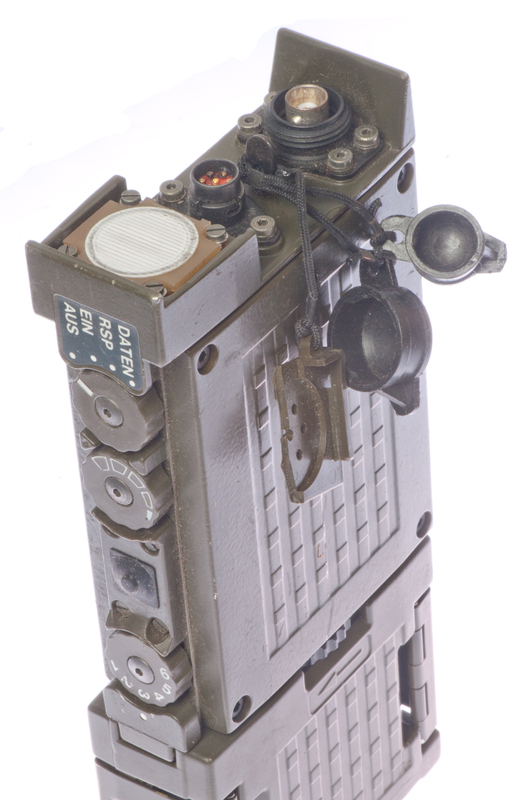 For the Korean Conflict and early Vietnam era it was replaced by the tube PRC-6 "banana radio" VHF low band handie-talkie. They were replaced by the solid state PRC-68 family (PRC-68, PRC-68A, PRC-68B, PRC-126, PRC-128, PRC-136, OF-185) handie-talkie radios. The SEM 52 family is in the same class as the PRC-68 family in terms of capabilities and size. All of the above VHF low band radios can interoperate and use some of the same ancillary equipment. The auido accessories have gone through a number of stages starting with 1/4" phone jacks, then to the U-77 10-pin connector and now the U-229 family of 6-pin connectors are used for many audio accessories, retransmission, crypto and data applications. 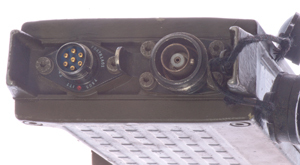 The SEM 52 radios use German connectors for audio and antenna connections. Has six crystal controlled channels. Requires a different "crystal Unit" to change the channel frequency. Covers 47 to 57 MHz which includes the US 6 meter ham band. But these radios are narrow band FM, not the wide band FM used by the US squad radios so they don't interoperate with US radios. TS-2839/GY German Audio Test Set - includes audio accessories for the SEM52, but not the U-229 NATO connector.